Need a dessert recipe with a few shortcuts? 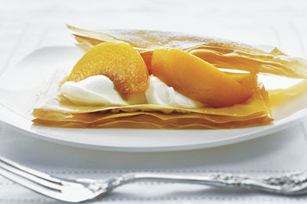 Our Delicate Peaches & Cream Napoleons might just do the trick. This recipe uses canned peaches, a simple cream cheese filling and crisp phyllo squares - just layer and serve! Stack phyllo sheets, spraying cooking spray between layers; spray top with cooking spray. Cut into12 rectangles; place, 2 inches apart, on parchment-covered baking sheet. Bake 2 min. or until crisp and golden brown; cool. Meanwhile, cook and stir 1 Tbsp. brown sugar and vanilla in large nonstick skillet on low heat 1 to 2 min. or until sugar is melted. Add peaches; cook and stir 1 min. or until evenly coated with sugar mixture. Cool. Mix cream cheese and remaining brown sugar until well blended. Top 6 phyllo rectangles with cream cheese mixture, then peach mixture; cover with remaining phyllo rectangles. Sprinkle with icing sugar. Serve immediately. Spraying the phyllo with cooking spray is a quick way to keep the layers moistened without having to brush with butter. Prepare as directed, substituting canned pineapple tidbits for the peaches and adding 2 Tbsp. toasted shredded coconut to the cream cheese filling before using as directed.